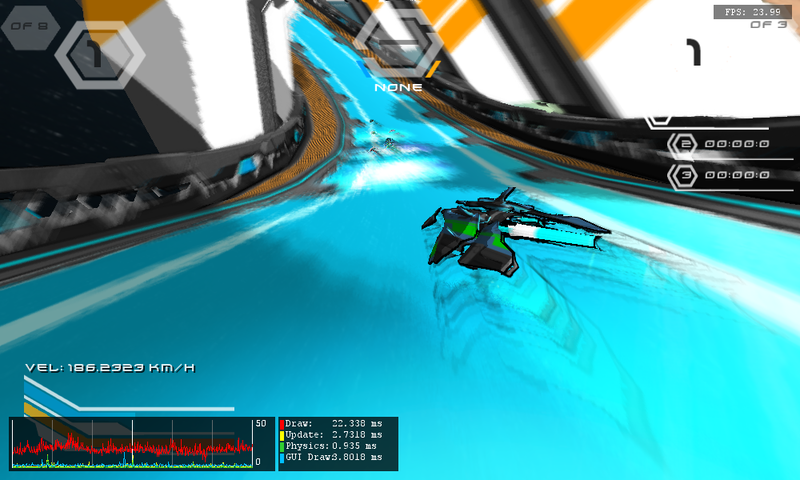 Once I had the core mechanic of Metric Racer down, I tried a number of ways to increase perceived speed to make it seem that the player was moving faster than they actually were in the physics engine. Initially I tried increasing the camera field of view as the racer’s speed increased, this worked (and is still in the game) but I was looking for more. To cut down on resource usage, I tried faking a camera motion blur by fading in the Blurred Scene Render target from the previous scene to sort of fake a camera motion blur. Increasing the amount of added blur as the speed increased. This sort of worked but gave some artifacts if there was a large enough speed drop or increase. So I decided to tackle a camera motion blur shader, which in the end turned out to be a rather straight forward shader once I had the method down. There’s 2 ways to do motion blur, Camera Motion blur, where the scene is based on the amount of camera movement, and Per-Object blur, which blurs each object based on it’s individual velocity. 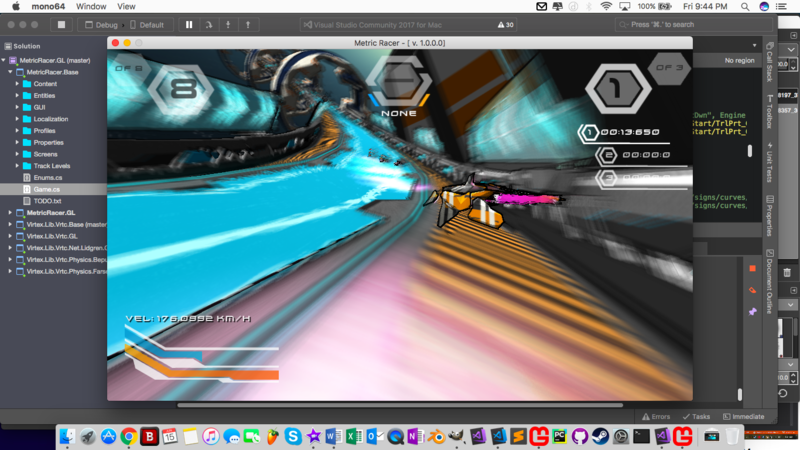 For Metric Racer I’m only using Camera Motion blur since the effect wanted is to give the feeling of increased speed without having to actually increase that speed. In the real world, the amount of an object blurring is due to a camera’s shutter speed setting. The camera sensor (or film in some cases) is taking in light while the object is moving. If the object is moving fast enough that the shutter is still open while the object moves, then the camera sensor (or film) picks up light from that object as it moves, blurring it. In Graphics programming, we take snap shots of the world generally 30-60 times per second (at least that rate is the goal). This means that an object is rendered at their position “statically” each frame. If we just took one frame we likely couldn’t tell which objects are moving and which aren’t. If we keep the physical camera analogy, Rendering a frame is like taking a picture with an instantaneous shutter speed. But since we have data of our objects that carry on from frame to frame, What we can do to give the feeling of movement is to blur the pixel colour values between the current and previous frames. It’s finding which pixels to blur with each other is the trick. For each pixel, we find the 3D world space position from the depth and UV’s of that pixel and from using the Camera’s InverseViewProjection matrix for the current frame. Now that we have the current Position in World Space for this pixel, We can then take the Camera’s ViewProjection matrix from the previous frame to get the the UV coordinates of that world position from the last frame. We now have two UV coordinates. We can then find the vector (blendVector) in screen space between the current and previous world positions UV coordinates. We then blur between these two positions using difference values and blurring methods to get the result we want. After an initial try, this was the result in the Vertices Test Bed. This generally gives a good look. although there are some caveats and short falls that can cause artifacts and issues. If one of the World Positions is offscreen between frames, then the effect will only be able to return a UV value of 0 or 1. If the UV coordinate is far enough off screen, What this creates is a banding along the edges. I didn’t initially find this out. 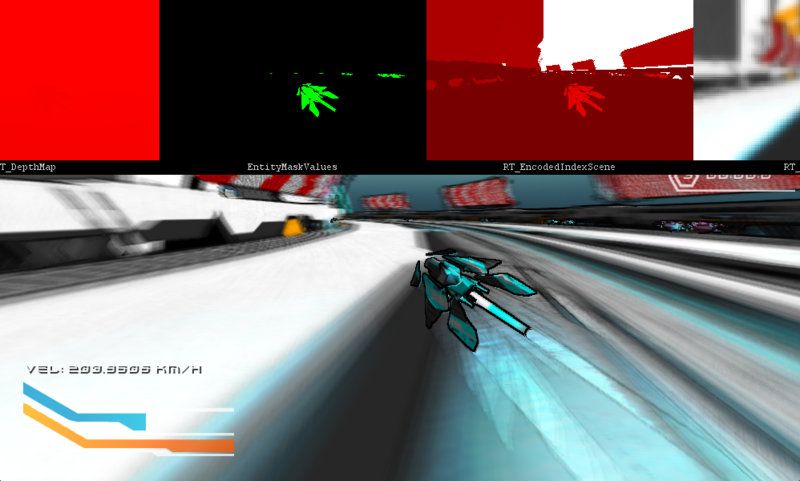 The base method works great in our test bed where the speed and movement is similar to a person, but when I ran Metric Racer with the effect on, the speed of the player is so high that a third of the screen was giving this off-screen UV artifact. My first fix was to find the intersection point with the screen along the blend vector and ‘reset’ the previous frames UV at this intersection point, but as this would add a few lines to our code, I found by simply knocking down the blend vector by 90%, this would remove the banding issues without much change in quality of the output. Since this is a Camera Motion blur, and not per-object blur, the scene blurs everything on the screen by it’s position from the last frame. This means that if the camera is following an object (like the player in Metric) then it will still blur this, which gives a really strange look. The result if you just blur without any masking. The fix for this is masking out which objects on screen shouldn’t be blurred. By doing a simple ‘mask check’ for a specific value from the mask render target (the Black and Green View), I get the a value that can factor the blur amount. The green value of the EntityMaskValues View controls which pixels are blurred and which aren’t. If you want to see a contrast, take a look at the initial video here. 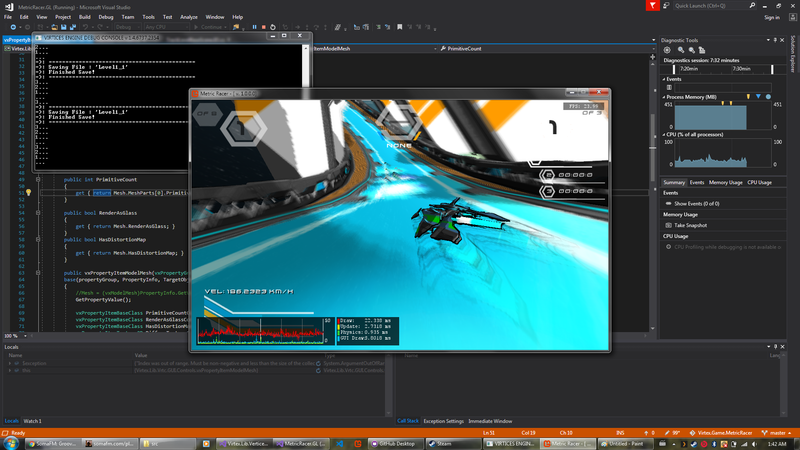 The entire point of using MonoGame is the ease of use with it for creating cross platform games. But what I can never get over is how 9 times out of 10, when I implement a feature, or especially when I write a new shader, when I take it over to another platform, it just works. I wrote this partially on my macbook, then polished on the windows PC, and then brought it back over and it just worked beautifully. I was able to get this working in an afternoon, there certainly are some optimizations and more fine tuning, but even with extensive blurring along the blend vector, this gives a really great result with a very little footprint. 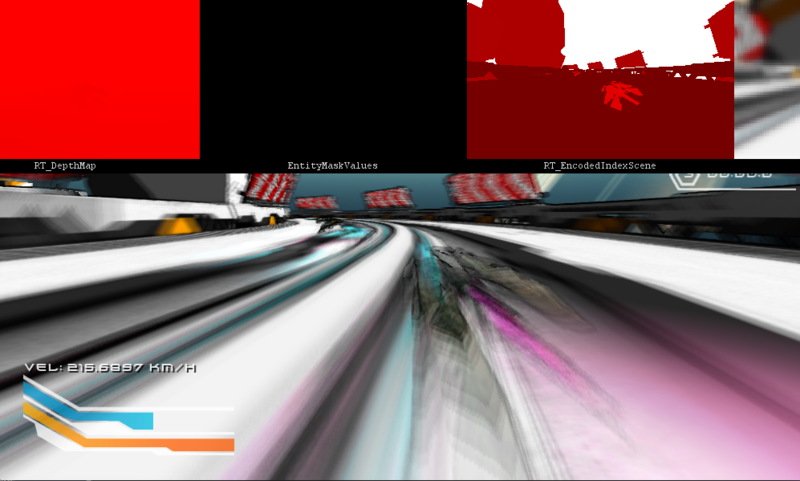 Entry Number 2 in the MonoGame Shader Series I’m writing over at Virtex Edge Designs site is on Camera Motion Blur. The technique is pretty straight forward but adds a great amount to any scene. Check it out below and don’t forget to give Virtex and my self a follow to keep up with the shader series and our upcoming releases.